What makes something count as a subject worthy of historical inquiry? And when does it become part of history? How many years must elapse for the present to become a past that can enter the space of the museum as an object of nostalgia and reflection? Such questions are grist to the historian's mill, of course. But it's impossible to avoid asking these kind of questions when a decade — the 1980s — that still seems very much part of contemporary experience and culture, and therefore not the arcane stuff of historical curiosity that is usually put on display in a glass-cabinet, becomes the theme for an museum exhibition. 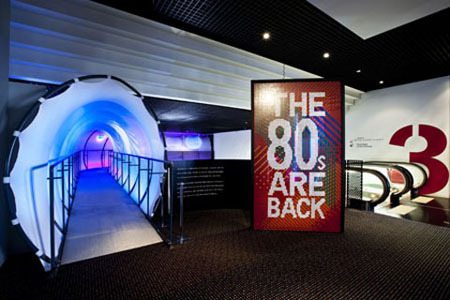 The Powerhouse Museum exhibition, The 80s Are Back, returns us to what can only be called the very recent past. It's a decade that a generation of people can still vividly remember — and perhaps would like to be given the time to forget. But in today's culture of recycling and revivalism, patterns of memory and forgetting are more complicated than ever. While what matters in the present is often defined through reference to the past, a nostalgic trip down memory lane increasingly takes us back to the future. And as The 80s Are Back clearly shows, the 80s are back in more ways than one: the recent revival of 1980s style in mainstream fashion, from glam evening wear to high-waisted jeans and legwarmers, has been matched by the return of the sounds of the 80s in the music of artists such as Empire of the Sun and Lady Gaga. 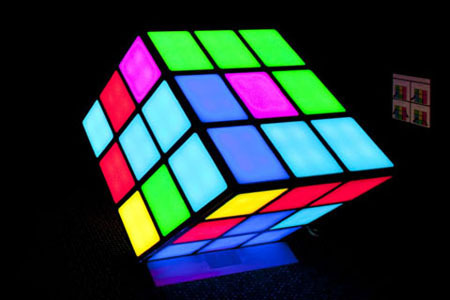 The 1980s is a decade that is best remembered for its excess. From Madonna's multi-layered outfits and ruffled ra-ra skirts to padded-shouldered power suits and Gordon Gekko's motto that 'Greed is good' — the 80s took the idea of the superfluous and made it the era's signature style. The display of abundance, in every sense, became the dominant design trend across a range of products and cultural forms. In 1981 it was symbolised by Lady Diana Spencer's billowing wedding gown with its 25-foot train — a voluminous style of dress that would influence a generation of brides over the decade. In music, the androgynous New Romantic image of Boy George, Adam Ant and Duran Duran represented a new trend of sexual and stylistic eclecticism and pastiche. The club culture and dance music of the 1980s also came to symbolise a new era — as well as a new kind — of individualistic hedonism. Mega dance parties, with electronic music and new designer drugs, redefined popular entertainment and the ways in which groups of people came together, interacted and enjoyed themselves. In politics and economics too, the imperative was to overcome the limits, rigid boundaries and restraint of previous forms of social and economic organisation and embrace a new platform of openness, flexibility, adaptability and individualism. In the United States and the United Kingdom, the decade of the 80s is inseparable from the neoliberal politics of Ronald Reagan and Margaret Thatcher. In Australia, the deregulation of the financial system in the mid-1980s by Prime Minister Bob Hawke and Treasurer Paul Keating transformed Australia from a 'closed' into an 'open' economy amenable to greater internationalisation. Thankfully, the exhibition succeeds in showing that the 1980s was a decade that involved much more than bad clothes, big hair and synthesised music. In fact, it was a complicated time of social upheaval, protest and transition. Perhaps the exhibition's greatest strength is the way it demonstrates that the years between 1980 and 1990 were not just a period of stylistic extremes, but very much a time of ideological extremes as well: when profligate prosperity was matched by a growing awareness of global poverty, when extreme individualism was tempered by new social movements, and when the Cold War and the threat of nuclear annihilation were countered by the collapse of communism and the nuclear disarmament movement. The conspicuous consumption and the global triumph of capitalism that seemed to best define the era actually went hand in hand with a growing global environmental movement that is only now, in the twenty-first century, emerging as a fully formed political project. For example, as the exhibition illustrates, in Australia the campaign against the Franklin River dam in Tasmania (a great item on display here is a bottle of 'Franklin River water' marketed by the Wilderness Society), was a nation-changing event that was foundational for the wider Green movement. Likewise, the campaigns for Aboriginal land rights are another example of the era's political engagement that the exhibition covers well. The 80s Are Back assembles much material (posters, artwork, photographs) on some of the era's defining moments in international and Australian social history and politics, including contentious events such as the 1988 Bicentennial celebrations. But the majority of the exhibition is devoted to the decade's popular culture, and music in particular. Curator Peter Cox wears his musical heart on his sleeve in the sections of the exhibition that explore the era's bands and musical styles. The Australian Indie music scene is well represented, to say the least. Kylie's career from 'Neighbours' star to pop icon is also dealt with in detail. 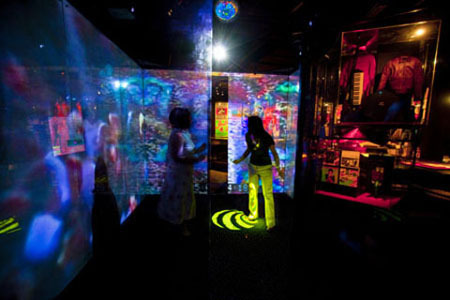 One of the exhibition's most delightful installations is an 'immersive music cube' that allows the visitor to step into a dance party and choose from a range of aural/visual options, including one of the famous Recreational Arts Team (RAT) New Year's Eve parties at Sydney Showground's Hordern Pavilion. The exhibition claims that by the end of the 1980s Sydney was recognised as the dance capital of the world, and herein is one of its possible flaws: it is very Sydney-centric. Similarly, while there is no doubt that dance and electronic music emerged as a significant subculture and were central to many people's experience of the 1980s, this is a very hip, urban account of the story. 1984 was the year of the Yuppie, according to Newsweek, and the exhibition effectively explores the life of the narcissistic individual whose world revolved around the personal computer (the Mac Classic), personal entertainment (the Sony Walkman), and personal wealth (the Amex credit card). But there is very little about non-Anglo Australian suburban life and experience. Also, the focus of the exhibition is almost exclusively on the young. How, for example, might the elderly have experienced the 1980s? So, while The 80s Are Back has a good shot at being as inclusive as possible, amassing a huge collection of materials on the everyday life of 'ordinary' Australian people — the shows they watched on TV, the clothes they wore, the music they listened to and played, their leisure activities — it seems the exhibition has been designed as a nostalgia trip for a very specific Gen X audience. In these terms The 80s Are Back is a great success, achieving a good balance of serious recollection and playful nostalgia. It also combines a good mix of the macro and the micro, of world historical events with the minutiae of daily life which, judging by the excited cries of 'Remember that?' and 'Oh look, I had one of those!' provoked from the majority of the exhibition's visitors, allows these objects of material culture to effortlessly evoke the pleasure and fun of personal connection and memory. The idea of a history of the present suggests that a historical awareness of our current circumstances, including our recent past, will provide greater insight into how the contemporary world has taken the shape it has, as well as how the past constantly reverberates through the present and into the future. All historical periodisation has its shortcomings and, in the end, the category of the decade is as arbitrary as any other. But while every decade seems to call for an accompanying adjective — the roaring twenties, the swinging sixties — the 1980s does not yet seem so easily, so simply, defined. The 80s Are Back shows us that defining the 1980s is a project that is still up for grabs. Perhaps this is because we are still living out so many of the era's consequences. Fiona Allon is a senior lecturer and ARC Future Fellow in the School of Philosophical and Historical Inquiry at the University of Sydney, and author of Renovation Nation: Our Obsession with Home (University of New South Wales Press, 2008).